Home » Entertainment » Music » Are You All-Seeing This? A popular trend is taking over the youth with a stronger force than before. The trend of covering or focusing on an eye has now developed into the next stage of metamorphosis. Photos are popping up on social networking sites (ex. Facebook) and has become a popular pose for following fans. It seems innocent and fun to mimic the famous, yet it cannot be explained by their followers coherently. 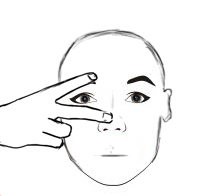 The most famous poses come as covering the right eye with the hand or with an object. In Egyptian Mythology, Horus was the son of Osiris and Isis, although other translations differ. He is often related to being the falcon-headed man associated with the sun. His right eye was gouged out in a battle with his uncle, Set. Thoth, the creator god, re-birthed Horus’ right eye. It was then believed that the eye was re-birthed every month, relating to the (lunar) moon. This would conclude that Horus’ left eye would be related to the sun. Some even believed that the pharaohs were embodied by Horus. The symbol today is known as the “All-Seeing Eye”. Represents concrete factual information controlled by the left brain. It deals with words, letters, and numbers and those things which are describable in terms of sentences or complete thoughts. It approaches the universe in terms of male oriented ideation. Represents abstract aesthetic information controlled by the right brain. It deals with esoteric thoughts and feelings and is responsible for intuition. It approaches the universe in terms of female oriented ideation. We use the Left Eye, female oriented, right side of our brain for feeling and intuition. 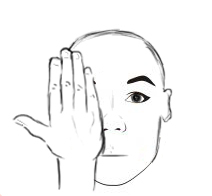 Covering the right eye symbolizes cutting off information to the Left Hemisphere of the brain. This area deals with words, letters, facts and logical thinking. Covering the left eye would block off information to esoteric thoughts, feelings and emotions. 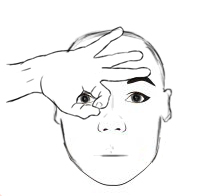 Conversely, make-up or props are being used to accentuate one eye (ex. 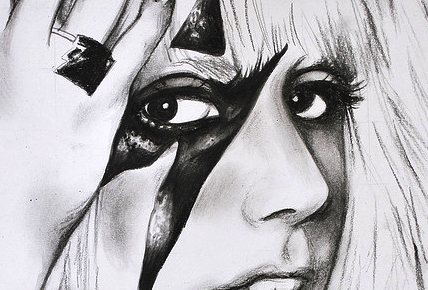 Ke$ha, Lady Gaga, Nicki Minaj, etc…) This would also be an example of rebirth. Indicates the loss of an eye. 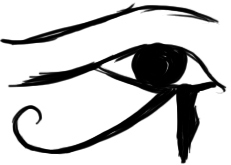 Usually it is the right eye of which Horus lost, meaning a poor, lost emotional state. Mila Kunis, an uprising star, recently stated her surgery for an eye she had been blind in for most of her life. After the surgery she had 20/20 vision. She is also found posed; covering her eye. “Circle indicates the sun deity and the (Masonic) never-ending quest for light. Satanism symbol for 666. Illuminati indicates an approval of their Divine King.” Read more in Texe Marrs’, Codex Magica. This could mean rebirthing spiritually. Being enlightened or living in a fantasy world. Lady Gaga is found using this method religiously. This isn’t the first time this has been introduced into our culture. Bob Dylan, Ozzie Osbourne, Bono, David Bowie, Jessica Rabbit and Madonna all used references to covering or illuminating an eye. It was accepted into the Great National Seal in 1782 and later put onto currency in 1935. It had been recently introduced in the recently emo rock culture in the mid 1980’s which has rekindled in the past 10 years. 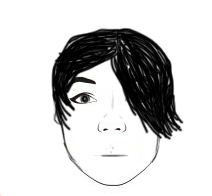 This movement often portrays what is called a “Peek a Boo” or an “Emo Bang”. 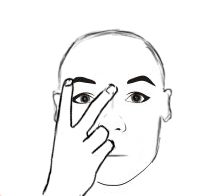 This is where the follower will shade one eye with their hair. Shadowing an eye is an indication of an emotional state in theatrical terms. The “Eye of Horus” is being spread on a larger scale. Instead of a few leaders laying bricks, you have multitudes paving the streets. The outlets are vast such as TV, Internet, Videogames and clubs. Children are posing to the “Eye of Horus”, glorifying false gods unaware. Sadly, it is right there; out in the open. They cover the eye that relates to logic, then others wonder why this generation lacks common sense and logical thinking. Now the population is bobbing heads, playing “their” songs on Rock Band and dancing to them in front of the TV. Instead, they need to take the blinders off, read the lyrics and ask “What does that mean?”. Those following with these artists should investigate without the music playing and read what they are singing. Below, are some of the artists involved. Story & Illustrations by Jesse W.